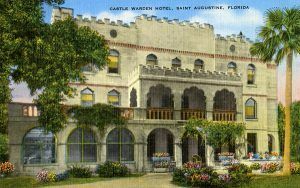 Castle Warden Hotel, Saint Augustine, Florida. Between 1941 and 1950. Hand-colored postcard. Courtesy Florida Memory. From the time you reach the parking lot of Ripley’s Believe it Or Not “Odditorium” in St. Augustine, Florida you know you are in for more than just an odd museum… you’re in for some pretty interesting history as well. The building that houses Ripley’s collection of strange and unique oddities was built in 1887 by William G. Warden of Philadelphia as a winter home. Warden, a partner to Henry Flagler and John D. Rockefeller in the Standard Oil Company, was also President of the St. Augustine Gas and Electric Light Company, and Financial Director of the St. Augustine Improvement Company. His home was one of the most imposing private residences in the city, built with Moorish Revival architecture and an elaborate interior. With Warden’s influential role in St. Augustine, the home was a center of winter social activity. The “castle” home remained in the Warden family until it was purchased in 1941 by Norton Basin and remodeled as the Castle Warden Hotel. Baskin and his wife, Marjorie Kinnan Rawlings, author of the classic novel The Yearling, had an apartment on the top floor. 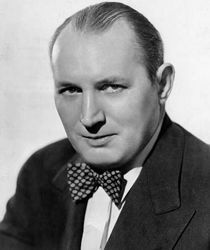 During it’s somewhat brief time as a hotel, guests included many writers and distinguished visitors, including Robert Leroy Ripley. Born in Santa Rosa, California around 1890, Ripley dropped out of high school to help support his family after the death of his father. By the age of 16 he was drawing sports cartoons for several San Francisco newspapers, and after moving to New York City in 1913, he began doing the same for the New York Globe. It was there that he originated his first Believe It or Not! cartoon in 1918, showcasing several sports oddities. Readers loved it, prompting it to eventually become a daily feature. He moved to the New York Evening Post in 1923, and in 1929, his feature was picked up by King Features Syndicate and the cartoon began appearing in almost 300 newspapers across the nation. Claiming to have visited 198 different countries, Ripley showcased “true life” oddities from around the world in book length collections of sketches, a series of Believe It or Not short films, radio programs and carnival like exhibits he called “Odditoriums”. During several visits to the Castle Warden, Ripley repeatedly tried to purchase the hotel, but would fail to see success in that endeavor before his death in 1949. In 1950, Ripley’s estate purchased the building and on December 25th the first and original permanent Ripley’s Believe it or Not! Odditorium had its grand opening. 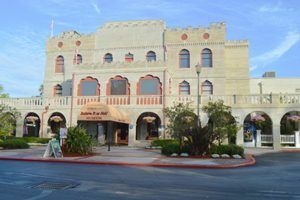 St. Augustine, FL – Ripley’s Believe it or Not Museum. Dave Alexander, 2017. Outside, on the museum grounds, we found several interesting tidbits, including “Massacre Anchor”, pulled from Matanzas Bay, where in 1565 hundreds were slaughtered by the Spanish for their beliefs, thus giving the bay its current name, Matanzas, meaning massacre. Near the anchor, on a ‘lighter’ note, we found a section of a tree, that when cut down in 1938 was 1900 years old, 267 feet high and 14 feet in diameter. This section was carved out into a small apartment, in which someone actually lived for a while. You can go through the log without admission to the museum. Other items outside the museum include a giant “bronco” made entirely out of chrome bumpers, along with a reproduction of Michelangelo’s “David”, one of only two copies in the world carved to the exact specifications as the original. The “modest” David is hidden behind a hedge row, so don’t worry about blushing as you pass by. From the moment we walked through the entrance, we were greeted with odd art, including famous entertainers memorialized in jelly beans, an antique small scale carousel, a piece of “art work” made of toasted bread, and other works. After entering, we enjoyed the carnival atmosphere of electronic palm readers, fortune telling machines and other trinkets of entertainment. From Zoltar, like the one in the Movie Big with Tom Hanks, to P.T. Barnum’s famous hoax, the Feejee Mermaid from 1842, which people from around the world paid 25 cents to admire, we were struck with the size of the collection found here. 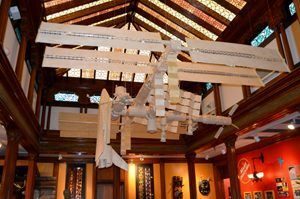 St. Augustine, FL – Ripley’s Museum Matchstick Space Station. Kathy Weiser-Alexander, 2017. Continuing to attract visitors far and wide, the museum houses three stories of odd and unusual exhibits collected from around the world. Many of these were in Robert Ripley’s personal collection, including shrunken heads, two headed animals, odd treasures and much more. The collection has continued to grow, including the recently added Space Oddities Gallery, which features a replica of the International Space Station made entirely of match sticks. 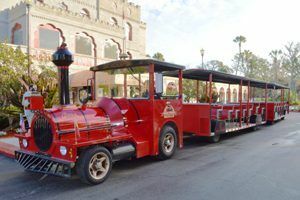 This was also the beginning stop on Ripley’s Red Train Tour through St. Augustine, giving visitors a 90 minute run through the history and sites of the oldest city in the United States. We learned quite a bit from the tour, which has more than 20 stops throughout the city, allowing riders to hop on and off to see the sites, with another ‘train’ stopping at each location every 20 minutes. We made a full day of it, first touring the museum, then getting on the Red Train and exploring St. Augustine. Well worth the admission to the museum, and cost of the Red Train Tour, this is one attraction we would highly recommend. If possible, come during off peak times, as we obviously aren’t the only tourists’ who have found the magic of Ripley’s Believe It or Not Odditorium and wonderful history to be found in Florida’s historic gem on the coast. © Dave Alexander, Legends of America, January, 2017.